Gabriel's Lad pulled clear in the final furlong to win the Victoria Cup at Ascot, and give trainer Denis Coakley his first victory of the season. 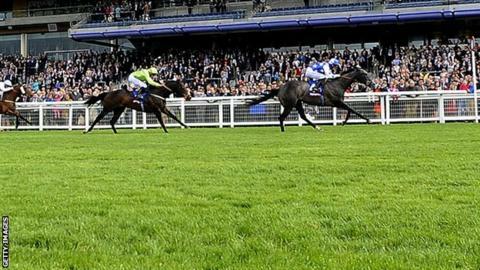 Ridden by George Baker, the five-year-old broke from the stand-side group of runners in a split 25-strong field. The 12-1 shot won for the first time in six outings, beating the game Glen Moss (16-1) into second by two lengths. Belgian Bill (25-1) finished third, with 9-1 joint-favourite Ayaar fourth under Frankie Dettori. Gabriel's Lad quickened up in timely fashion just inside the last of seven furlongs as early leaders Purcell and Dubawi Sound slipped back through packs of horses on either side of the track. After hiding his ride away among the stand-side group, Baker called for an effort, saying afterwards he had reaped the rewards of a strong gallop. Newbury-based Coakley's victory came at the 13th time of asking since the new flat season began on 29 March. "Things went right for the horse today, and he's plenty good enough when things go his way," said Coakley. "He likes Ascot, cut in the ground and a straight track, so those things will be considered when we think about what comes next."